I read the first couple issues of Morrison‘s NEW X MEN run, along with the first issue or two of that "new era" of Uncanny X-Men as well (and I think same for X-Force and/or X-Statix and Soldier X) before trailing off for awhile. I got back in toward the latter part of the run, having obtained the first two "deluxe oversized hardcovers" and not wanting to wait (then) for another. I remember making a special trip to the Toledo comic shop while visiting a friend for her graduation in December 2003, largely to get #150…and reading it left me with quite a surprise. 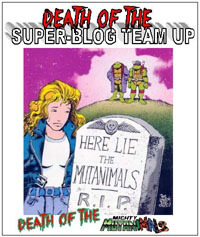 Jean…dead? Well, SURELY, being Marvel, she’d be back pretty darned quick. A year, maybe two? Endsong kinda let me down, and I’m not sure if I ever actually read Warsong. Move through time–2004, 2008, 2012…the Jean from the past was brought to the present (how long would THAT last? A year or two? The premise of the "original five" coming to the present sucked me into All-New X-Men for a bit!). 20012 to 2016, still the "original five." Into 2017…now the very tail-end of 2017, and we have this issue. Phoenix Resurrection #1 (never mind that 1995 gave us a Phoenix Resurrection in the Ultraverse books!). Unlike the anecdotal "disaster" of the ordering requirements for the main wave of Legacy Lenticulars (LL, anyone? 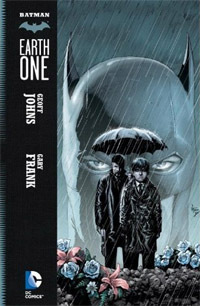 ), this one’s "main cover" is *A* lenticular…but this one is actually done "right." Gone is the blurred mess of two static images blended together to approximate a real-life "gif," here we have an image of several of our mutants reacting to the flaming appearance of Dark Phoenix–Jean Grey–in the Red Costume…and we get that 3D/slight movement effect that DC has used to great effect and that had put to shame Marvel‘s versions. My main complaint with the cover is that it is at best symbolic, or some sort of prelim for use with an eventual collected edition…as has become the "norm" for modern comics, the cover does not necessarily depict what’s contained within the issue itself. Visually, this is a pretty book, and I enjoyed the art itself throughout. As I’m no longer closely familiar with much of the X-verse, and am aware of plenty of recent changes and such, nothing much stood out in a negative way for me, and I marked inconsistencies up to my unfamiliarity; nothing seemed horrendous or off-putting to me. Where I have problems with the visuals is layouts: the issue has 30 pages of story, 32 content pages if you count the "cinematic" double-page splash with the series’ logo and credits for the issue (in place of an opening/frontispiece to be simply omitted in collected format). While I applaud the relatively "strict" panels/gutters–a "classic" sort of page layout rather than EVERYTHING being full-bleed quasi-panels and such, I was not thrilled at so few panels per page–many pages having a mere 3-4 panels, a number of them having only 2, with very few words to a page. One page has a whopping THREE WORDS: "Elsewhere," "Well," and "fudge." (18 letters, not 18 words!). Yeah, the art is an integral part of telling (selling?) the story, but given this IS a comic book and not actually cinematic video, I’m rarely keen on "wasted space" trying to imitate another medium. Story-wise, I did not feel that this issue remotely lived up to the hype or expectation–at least not the hype and expectation that I personally laid at its feet. Phoenix Resurrection. The Return of Jean Grey. 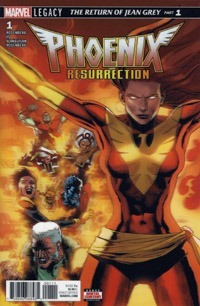 Dark Phoenix (not Phoenix) depicted on the cover. Shiny cover. Surely Jean would appear in this issue, with plenty of questions as to her authenticity, what brought her back, why she’s back, what it means for "Young Jean," how it’ll affect other characters, if it has anything to do with "Regular Real Not-Old-Man Logan/Wolverine" being back, etc. Appear in this issue, set up questions and four more issues to dig into the details, the effects, push this story itself forward, etc. While I can guess that the Jean we see toward the end of the issue is supposed to be "our" Jean (though whether it implies she’s been alive awhile–long enough to have a job and home and life with no overt recollection of life as one of the X-Men, or is some sort of dream-sequence or illusion or some sort of alternate life in her mind as her body heals/comes back/whatever) is not clear to me as of this single issue, on a typical single-read-through that I give whatever (new) issue(s) I read. I don’t see THAT she’s back (or not). I don’t see if there’s actually another force behind her return (the Phoenix Force) or if this is some sort of self-resurrection from her having BEEN one with the Phoenix Force in the past. Is there likely some other Big Bad waiting in the wings? Other than Jean maybe showing up/being back and having to figure out for herself what it means to her as herself, what’s the driving conflict of this title? What makes it justify five weekly issues (and I think a tie-in for a sixth issue) vs. Jean just showing up again/being a subplot in some sort of main title? I’m curious about stuff–especially given I was there when she died back in 2003’s New X Men #150, and expected her return at least a decade ago–so will get the next issue, at least. And I would not be surprised if this was a good opening chapter to the eventual "graphic novel" when this series is collected into hardback, deluxe oversized hardback, and/or TPB. But as a single-issue, as a first issue of a mini-series, I’m not impressed with this, and would not recommend it if you’re looking just to do a toe-dip on stuff…especially at $4.99 instead of $3.99. As an art piece, the cover wouldn’t be bad to hang on a wall or such. Unless you’re eager to read/follow along in "real time" as issues are released (and given the title/subtitle, it’s not like there’s really any mystery as to whether or not it’s actually Jean, if she’ll actually be back, etc.) you’re probably better off waiting a couple months for the inevitable collected edition, if anything. Otherwise, if you’re willing to invest in a 6 issue story within about 5 weeks, and you’re a fan of Jean herself, I’d say this is worth getting, as an opening chapter, that is by no means a stand-alone issue/story.